« Who’s on your Post Season roster NOW? Subscribe to comments with RSS or TrackBack to 'How do we stack up against Chicago for the NLDS?'. I’m perfectly fine with the national media fawning over the Cubs and making them the favorites, but honestly, I just don’t see it. What the Cubs have going for them are the playoff success experience and a reasonably hot finish to the regular season (which Fangraphs says doesn’t mean anything). What the Nats have are more good hitters than the Cubs have, more dominant starting pitchers than the Cubs have, and better bullpen depth. Am I missing something here? Starting pitching: the Cubs have no one close to the level of where Stras and Max are right now. That doesn’t mean that Stras and Max are guaranteed to pitch up to that level or that the Cub starters won’t step it up, but this Cub rotation is no where close to what it was last year. Lester has a 4.33 ERA and 1.323 WHIP, and he’s apparently going to be their lead dog. In the bullpen, I would call Davis and Doolittle pretty close right now. I’ll take Madson over Edwards as the setup man any day of the week, though. The Nats have clobbered Edwards, particularly when he has pitched back-to-back days. The Nats aren’t THAT much better than the Cubs on any front, but they are better. Alas, we know that doesn’t mean anything considering how much better the Nats were than the Giants in 2014. 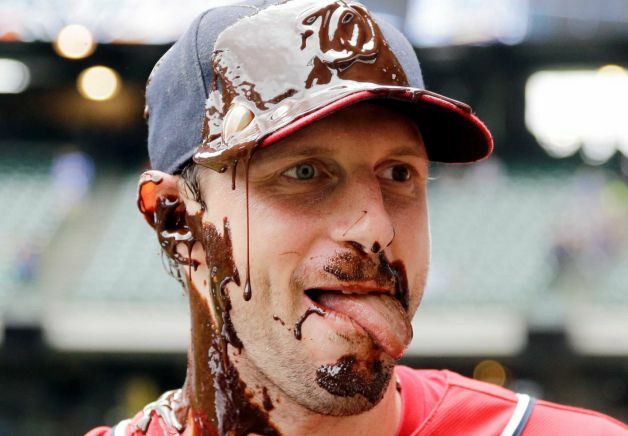 The playoffs are a crap-shoot, and the Nats have crapped out three times. I like the feel of this situation, though. Let’s start by winning a Game 1 for the first time ever. That’s the only way we can get a sweep, right? I feel good about the Nats team and chances, but I think KW’s argument makes the point too strongly. I’d make it 55/45 in favor of the Nats. what I like is that with Werth and Harper back to form, there really is just 1 hole in the lineup (C). Injuries make pitching a bit of a question mark, but when healthy KW is right that they are clearly better than the Cubs rotation. I’m not going to predict anything though. Just a fool’s game (plus I am a little bit superstitious about that stuff). Whoa, Coppy out at ATL. Some kind of international signing issue. Feels like Jimbo all over again. I think Philly becomes the next NL East team on the rise. I thought that before this news but it certainly doesn’t help. Atlanta has best farm system in the game, probably thanks to sneaky sh*t, so that’s just awesome. Just in time for the hard cap to go in place so nobody can really benefit anymore. Philadelphia has a number of very top end prospects right now and a lot of them are in the upper levels of their minors … (http://m.mlb.com/prospects/2017?list=prospects) plus they have a TON of cash coming off the books; they had $100M in payroll this year and have a pre-Arb TOTAL of just $6.8M committed for 2018. that’s just ridiculous. I count 5 arb cases but none of them are going to be even to 8 figures; they might roll out a payroll that would make the Marlins blush in 2018. And then they could throw $40m/year at Harper or Machado or Trout (who, lets not forget, is from Philly’s back yard in South Jersey) and remake their team. The Mets still have all these high end arms and maybe a proper manager might actually keep them healthy. Its looking like Miami is going to bottom out themselves; Stanton already making waves about getting out and Jeter is firing everybody (or rather having someone else fire everybody) before he even gets the keys. NL East may still be there for the taking for the nats for a while if they can get the likes of Robles, Soto, Turner, Eaton to produce at 5-6win levels as we lose Harper. One nit, KW: we won G1 in 2012, though G1 was in St. Louis. The Nats have never won the first game played in Nats park – losing G3 in 2012 and G1 in 2014 and 2016. The Nats’ last six postseason losses have each been by one run. Picture Philly with Arrieta, Cobb and Moustakas. That’d be a tough team starting next year, with all those prospects coming. I think the Mets have significant issues now. If Thor is back, that’s a great top two but no one strong after that, plus health issues. The lineup also,has major issues now. Cespedes should be back, but Conforto has a serious injury. Rosario should be good in time but Smith isn’t showing much. Who else would you be excited about in their lineup. Atlanta – I dunno, just not seeing it yet. The opposite of the Mets problem. The lineup is fine. Swanson will be ok, I guess, but 2d tier SS, imo. I like Albies and Incinarte, and Freeman of course, and let’s assume Acuna is the real deal. That’s youth and talent. They still have some holes but if Freeman keeps this up, it’s a decent lineup. But where’s the pitching? There is not one guy I’ve seen who scares me. I know they have a big pipeline and maybe I’m missing it, but I’d like to see some real studs before I get worried. Miami – ah, I’ll worry when they actually give me reason. Damn, Laz Diaz on the Nats crew. Now that could be a problem. Sample sizes are too small to even look at if you’re just using 1 year. The Nats rotation is just so much better than the Cubs; think that overrides everything else. It’s a given that Maddon will run circles around Dusty but that won’t be enough. Not claiming huge differences, but if the Nats execute, they’re better, both offensively and particularly in starting pitching. But having demonstrably better regular-season starting pitching is no guarantee — just ask the Braves of the 1990s. The postseason is a combination of talent, execution, and luck. It’s about time the luck swung in our direction for once! MLB owes the Braves some serious consequences if the stories about Coppolella are true, including fines, lost draft picks, and an international signing freeze. Wally, I’m very curious about whether Miami is going to have a fire sale. If they blow up that OF, that’s a big mistake, but it would help the Nats. If the Fish got some legit starters and got Prado healthy, they’re not that far from wild-card contention. They’d have to sign the starters, though, as they’ve got very little to trade. The Mets are stuck needing to rebuild but in a big market where it would be embarrassing to do so. They had the arms to carry them across the transition but have all but ruined them. Bottom line: no excuses for the Nats not to keep rolling next year. I think the Braves might be in more serious danger. Passan reporting that their big signing last offseason may be in jeopardy of being declared a FA (Kevin Maitan). – paying for benefits for IFAs before they were officially signed. Mine are pretty much in agreement with Boz and Barry S. Is it wishful thinking to put the Nats in the WS? We’ll see. All in all, I think Boz is right that this may be one of the deepest top eights in recent memory. That means that the it’s going to be a difficult run to a title for any team. Tonight, I would laugh long and hard if the Twins take out the Yanks. I don’t think it’s going to happen, but it would be fun to see. Braves’ mess: wow. There should be an unprecedented level of punishment. I’ll do a playoffs prediction piece tomorrow once we know who wins the NL wild card.